Rice cookers are convenient appliances, but if you're trying to save space or just want to experiment, preparing rice in a Crock-Pot is a good alternative. Also called a slow cooker, a Crock-Pot is an electric device that cooks at temperatures low enough that it doesn't require constant supervision. The slow cooker lets you set it and forget it, making it simple to whip up a simple side dish or even a luxurious risotto. Add rice and water or broth to the slow cooker. The ratio of liquid to rice depends on the type of rice you're making, but the general rule is to use 2 cups liquid for every 1 cup uncooked rice. 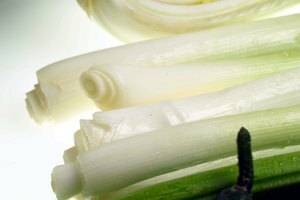 To infuse additional flavor, add in minced herbs or aromatics like scallions, shallots or garlic. Stir approximately 1 to 3 teaspoons butter or oil into the mixture. Adding a small amount of fat helps lubricate the grains of rice and prevents them from becoming overly sticky or gummy. Cover the slow cooker and cook the rice on high for approximately 2 hours, or on low for 4 to 5 hours. You'll know when it's fully cooked once the rice is tender and absorbs all of the liquid. Pour water, broth or wine into a pot and warm over medium heat. Use approximately 3 to 3 1/2 times as much liquid as the amount of rice you're cooking. In a separate large pan, melt butter or oil over medium heat. Sauté herbs and spices such as chopped green onions, shallots and garlic. Cook the vegetables until soft. Add the rice. The best rices for risotto are starchy but dense; arborio is a popular choice. Mix well with the butter, herbs and veggies, approximately 1 to 2 minutes. Pour the rice and vegetables into the slow cooker with the warmed cooking liquid. Cover the slow cooker and cook on high for 2 to 2 1/2 hours, or until the liquid is completely absorbed. Stir in 2 tablespoons butter and a pinch of chopped fresh basil, parsley or oregano. Toasted nuts, mushrooms, cooked meats, fish or greens like spinach or kale make terrific additional ingredients. Add grated Parmesan or Romano cheese. Stir the mixture and serve while it's hot. 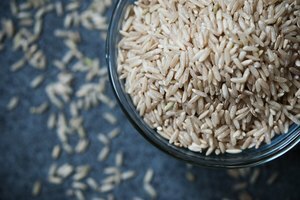 To avoid the rice becoming too soft, choose a hearty wild rice like brown basmati, or a converted rice. 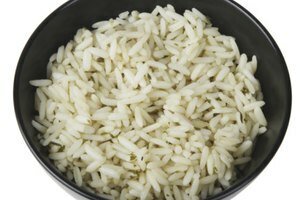 Converted rice is steamed before it's hulled, leaving it firmer and more capable of staying firm during long cook times. Add deeper flavor to the dish by toasting the rice before adding it to the slow cooker. Melt butter or heat oil in a skillet over medium-high heat. Sauté the rice for approximately 4 to 5 minutes, or until golden and lightly fragrant. Check the slow cooker's manual to determine if it's necessary to spray the inside of the pot with nonstick cooking spray before adding the ingredients.